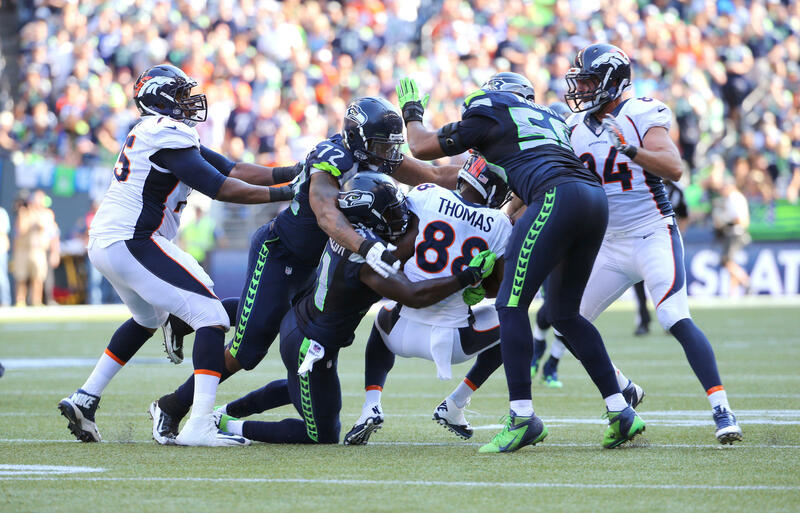 The Seahawks return home for their 2013 CenturyLink Field debut on Saturday night when they host the defending AFC West champion Denver Broncos. Last week the Seahawks backups were able to put their foot on the throats of the San Diego Chargers en route to a 31-10 victory. The Broncos are coming off a 10-6 victory over the San Francisco 49ers. With a victory on Saturday night, the Seahawks will break a franchise record for most consecutive preseason wins. 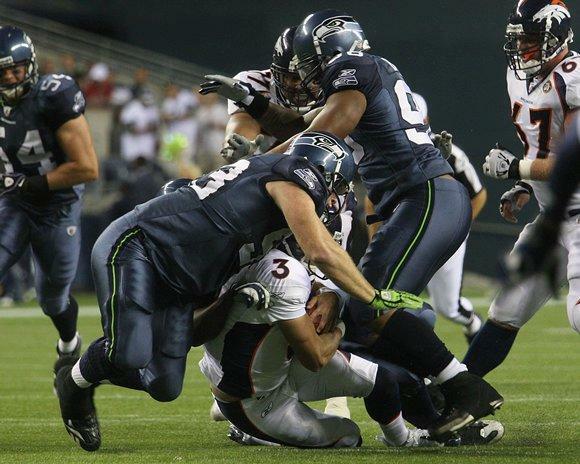 A win over Denver would be Seattle’s 7th straight preseason win dating back to 2011. Here are some things I will have my eyes on while in attendance at the game this weekend. According to King 5 sports, the Seahawks starters may play into the second quarter on Saturday night and some starters may even play the entire first half. After a dismal performance by the first-team units last week, I am looking to see a lot of improvement on both sides of the ball. On offense, I want to see improvement mostly from the offensive line. Russell Wilson had to create space because his protection broke down several times last week. If Max Unger is back in the lineup Saturday night, definitely expect to see better pass protection for Russell Wilson. I also would like to see the Seahawks run at least a couple of zone-read option plays. Wilson and the starting offense ran no zone-read option plays against San Diego. In my Chargers review I wondered if the Seahawks would wait until the regular season to progress the playbook. Against a talented defense like Denver’s I think it would be wise to run a couple zone-read plays to see the level of effectiveness. On defense the first team defense gave up a long drive to Philip Rivers and the San Diego offense which resulted in a field goal to start last week’s game. We were missing several starters on defense last week including Cliff Avril and Bobby Wagner, but this week I expect to see more significant improvement than the offense. At home, even in the preseason, the defense can play at a “lights out” level. I hope to see better quarterback pressure and a minimum of two sacks in the first half. With Avril continuing to recover from an ailing foot I am anxious to see who will step up as a defensive end pass rusher. Possibly look for Michael Bennett to stretch outside this week to play defensive end. I am also hoping that his play last week against the Chargers has earned undrafted rookie Benson Mayowa an opportunity to see first half playing time with the first and second string units. His improvement in practice this week has earned him some playing time earlier in the game in my opinion. There are several position battles continuing this week to keep your eye on. After last week I believe Tarvaris Jackson has a leg up on Brady Quinn for the backup quarterback job. Quinn will have to play very well and make no mistakes this week. If Jackson continues to impress later in the game he will win the job in no time. Expect to see Robert Turbin get a good amount of playing time this week as well. Turbin practiced for the first time during training camp this week and there are some people who believe rookie Christine Michael could beat out Turbin for the backup running back spot. Last week Stephen Williams impressed at wide receiver. There are several other receivers who need to step up but the man I continue to watch is Chris Harper. Fourth round picks usually make the roster but with the talent and depth the Seahawks have, Harper may be in jeopardy of not making the team. A strong game against Denver can do nothing but help him to make the team moving forward. 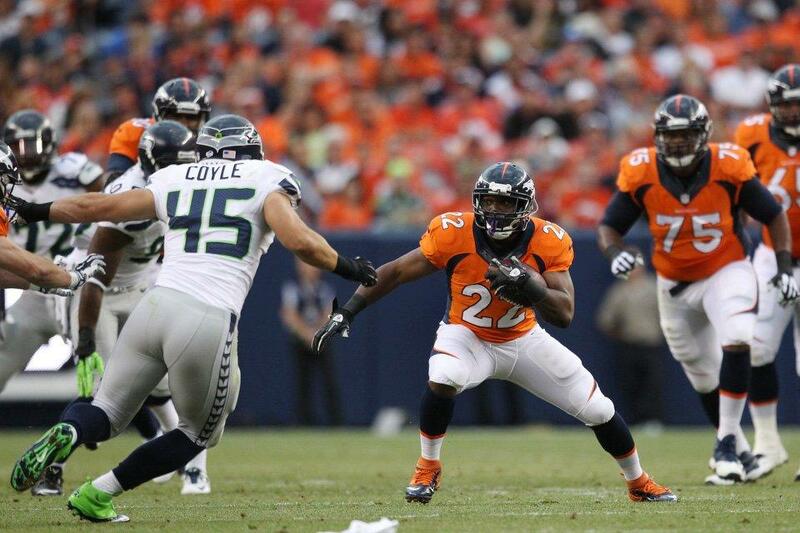 The Denver Broncos enter Seattle with one of the most explosive offenses in the NFL. Denver has come a long way from the Tim Tebow era two seasons ago and now feature four-time NFL most valuable player Peyton Manning at quarterback. The Broncos also welcome new weapon Wes Welker to the offense. We will not see much of the offense and even less of Manning this week. Instead, we will see a lot of backup quarterbacks Brock Osweiler and Zac Dysert. The Denver offense could only score 10 points last week. Granted, they played one of the best defenses in the league in the San Francisco 49ers but the Broncos backups are in a similar situation to the Seahawks backups. They need to show improvement or else with the 12th Man behind the Seahawks defense, it will be a long night for the Broncos. USA Today is reporting that the Broncos have a pistol package installed in their offense and that could definitely be a weapon if they choose to use it since they did not run a pistol style formation last season. The Broncos defense is also a very strong unit and it will be interesting to see who steps up as a pass rusher given that Elvis Dumervil signed with Baltimore during free agency. I am excited to see Von Miller, assuming he plays in the first half and I am especially excited to see Champ Bailey, most likely one last time. The Broncos defense did a good job of shutting down San Francisco’s offense last week. They did not allow a touchdown. Red zone offense will be my focus for the Denver defense. If they are effective and can hold the Seahawks to field goals, they will be in good shape once the regular season rolls around. Random Thoughts: It is going to feel so good to be back in my seat at CenturyLink. This is my 8th season as a season ticket holder and I have seen every game in that time from the same seat… I’m not bringing a bag in this week but it’s going to be a pain trying to get in the stadium due to the new league wide bag rule. I’ve seen some stadiums really have trouble being organized… Remember to “stuff the bus” for the back-to-school supply drive this week… Will the Seahawks wear a different color pant at home this week? They wore blue jerseys and blue pants for all 10 home games last season… I am excited to see Peyton Manning again, even if it is only for a couple drives. I love being able to watch all-time greats play live. I saw Manning play the Seahawks in Indianapolis in 2009, a 34-17 Seahawks loss… I am taking one of my best friends and roommates Clayton to the game. He has never been to an NFL game before so I’m excited for him. He’s not that big into football but he’s told me how excited he is on multiple occasions already… There is an unnamed referee retiring after the 2013 season so the NFL is conducting on-the-field tryouts of potential future NFL referees during the preseason. The Broncos/Seahawks game will be officiated by Ronald Torbert. I know nothing about him… The weather forecast for gameday is a high of 73 degrees and a chance of rain during the game. It has only rained during one preseason game I have ever gone to… The starting unit that gets introduced Saturday night will be the unit introduced before the home opener against San Francisco. I hope it is the offense… Not sure what the pregame tailgating plan is yet but I wouldn’t be surprised if we make camp at the Hawks Nest Bar and Grill before the game… This will be the last game I attend while living in my Seattle house. I’m moving back to the Eastside at the end of the month. A lot of fun bus rides and tailgates last season with my roommates before the games. I will definitely miss those experiences. Prediction: The Seahawks backups have shown they can make plays and I expect nothing less this week, especially at home. Russell Wilson will lead one impressive scoring drive in the first half and Peyton Manning will struggle getting offense momentum at the beginning of the game. The Seahawks will extend their franchise record preseason winning streak on Saturday night. Look for a review of the Seahawks preseason home opener on Sunday afternoon. Go Seahawks!